In the spring of 1949, The Christian & Missionary Alliance (C&MA) head office in New York contacted Pastor Norman Galbraith at the Alliance Church in Beaverlodge, to express their desire to see a work started in Grande Prairie. In June, this proposal was presented at the District Conference in Calgary. The Galbraiths were appointed to move to Grande Prairie, to begin laying the foundation for an Alliance congregation here. Shortly after the Galbraiths had moved into Grande Prairie, Pete Toews and John Wiebe agreed to act on the new Executive Board. By the time the summer had ended, a property had been purchased, and a building had been purchased and moved onto it (the building was the old McLaurin Baptist Church). This inaugural location was near the corner of 100 Street and 102 Avenue, which today is the parking lot of the Re/Max building. On August 14, 1949, the opening service was held, with 140 people in attendance. In November, 1950, the Charter Membership of the Alliance Tabernacle was formed. One of the original members, Mr. Oswald Throness, is still a member and a regular attendee of the Grande Prairie Alliance Church today, 49 years later! 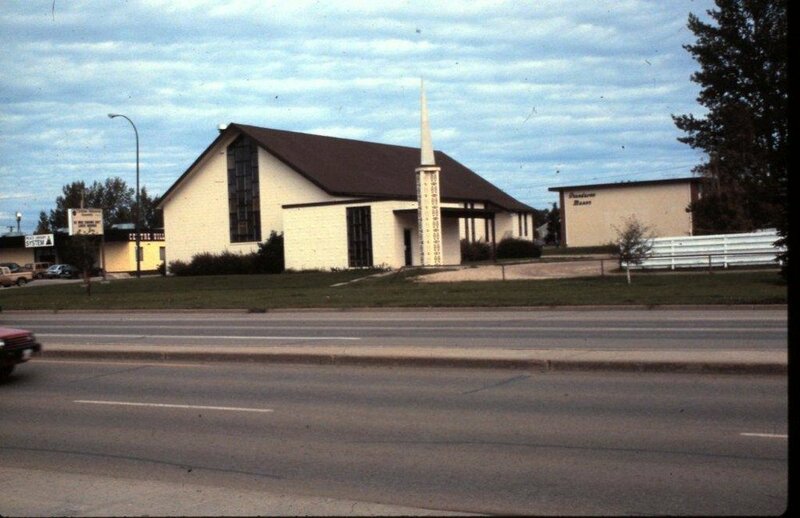 The church relocated in 1955 to the corner of 101 Street and 109 Avenue, and then again in 1963 when they built a new building at the corner of 100 Street and 108 Avenue (current location of Believer’s Bible Fellowship). During the late 1970’s, the church experienced such growth that plans were made to build again at 7702-100 Street under the leadership of Rev. Del McKenzie, the church dedicated its new home on June 10, 1979. In 2010 we built a new 60,000 sq. ft. building just north of the city limits at 15502 102 Street. Through all of these changes, years and locations, God has led us and blessed us. We look forward with great anticipation to the years to come as we serve the Lord in Grande Prairie and the surrounding area.